For Kevin Bacon, the thought of going out on an “Actors Rock” style music tour with other actors who have bands is not something that would bring a smile to his face. Like Kiefer Sutherland, Priyanka Chopra, Hugh Laurie, Juliette Lewis and Jennifer Lopez, Bacon’s main claim to fame is as an actor. But, he has also been a serious musician performing with his brother Michael as the Bacon Brothers for almost a quarter-century. Bacon is not an actor with a band or a musician who acts. He is both a musician and an actor and, for him, they are separate careers. “I would never want to tour with other actors,” said Bacon, during a phone interview last week from a Bacon Brothers tour stop in Annapolis, Maryland. 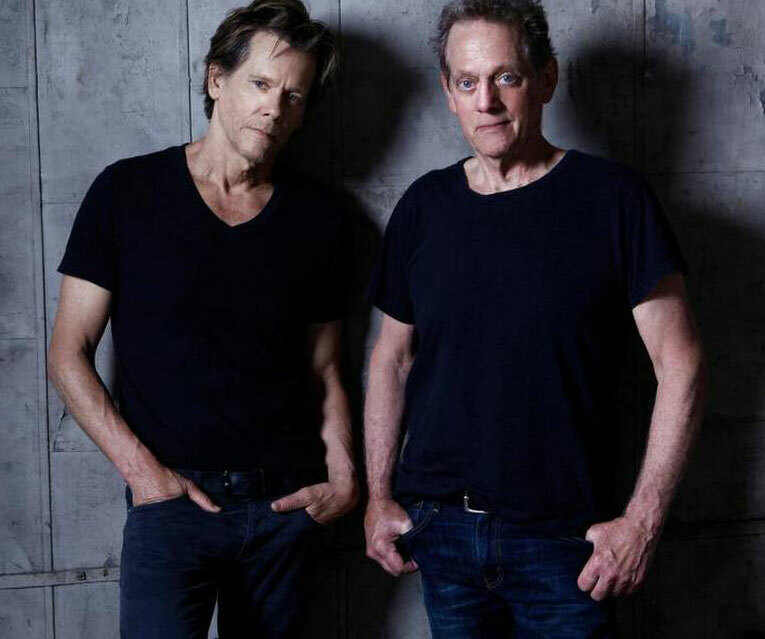 On August 11, Bacon (the rocker) and his brother Michael will return to their hometown area for a Bacon Brothers show at the Keswick Theater (291 N. Keswick Avenue, Glenside, 215-572-7650, www.keswicktheatre.com). Smith is the former “Saturday Night Live” music director and guitarist of Hall & Oates. With Michael teaching at Lehman College in the Bronx and Kevin spending a lot of time in Los Angeles, time for the brothers to get together to work on songs is a precious commodity. “It was so great to be able to sit around and look at each other,” said Bacon. “When we were in the studio, there was a great vibe in the room. Joe Mennonna was there pumping out sounds on his Hammond B-3 and Leslie speakers. Kevin and Michael have been making music together since they were kids and performing as a real band since 1995. The Bacon Brothers’ debut album “Forosoco” was released in 1997. Kevin Bacon is an award-winning actor with 80 films and dozens of television and stage credits to his name, resulting in numerous Emmy and Screen Actors Guild nominations in his resume. Older brother Michael initially began making music in Philadelphia before moving to Nashville where his songwriting career blossomed. An Emmy-winning composer, he most recently scored the documentary “That Way Madness Lies” currently on the festival circuit. As time went on, Kevin built up his acting resume, but the Bacon Brothers also moved forward. “We had been writing to try to pitch songs to other people or to put the songs in my movies,” said Bacon. “We did a demonstration tape. A friend invited us to sing at his venue – the TLA. The two siblings share a singular body of work that’s found them spending more than 20 years of working the road and paying their dues, resulting in eight albums – “Forosoco” (1997), “Getting There” (1999), “Can’t Complain” (2001), “Live: The No Food Jokes Tour” (2003), “White Knuckles” (2005), “New Year’s Day” (2009), “Philadelphia Road” (2011) “36 Cents” (2014) and “Bacon Brothers” (2018). Sold-out gigs in New York, LA, Nashville, Chicago and San Francisco followed, as well as a high-profile show opening for The Band at Carnegie Hall and appearing alongside the likes of Shania Twain and Wyclef Jean on the TNT Network’s “The Gift of Song” special. In eight years of recording and touring, the band has become a top live draw and continues to build momentum. Video link for the Bacon Brothers — https://youtu.be/QPuY_Y4QbL8. The show at the Keswick Theater will start at 8 p.m. Tickets are $39, $49 and $59. Another interesting show on August 11 will feature Echo Courts. 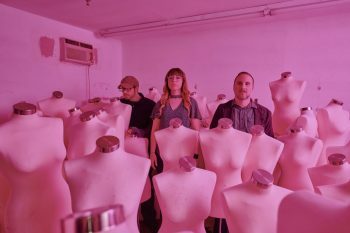 The Carolina-based band — Kelly Fahey, Jean-Luc Swift, Nate Goldsmith, Nick Parascandola — will make a return visit to Philadelphia to headline a show at Johnny Brenda’s (1201 North Frankford Avenue, Philadelphia, 215-739-9684, www.johnnybrendas.com). “The band started in 2014 and we’ve played Philly three times,” said Fahey, during a phone interview last week as the band travelled to a gig in Atlanta, Georgia. “This weekend’s show was originally scheduled for Kung Fu Necktie, but it got changed. We’ve never played Johnny Brenda’s before. We’ve heard great things about the club so we’re really looking forward to it. Echo Courts released their first LP “In the Garden” in July 2016 on Negative Fun Records. “We toured our last record,” said Fahey. “Then, everybody that was in the band at the time got busy with other stuff. We had a six-piece back then. People left, and it was down to me, Nate and Luc. Then, we picked up our drummer Nick a little while ago. Echo Courts just released its sophomore album “Room With A View” on July 13 via Refresh Records. The new songs evolved over the course of six months of playing live shows in the Mid-South region before the band finally decided it was time to commit them to record. The result was an album with a cleaner, more focused sound. Recorded and produced by Jean-Luc Swift at A Domestic Studio and mastered by Kris Hilbert at Legitimate Business, “Room With A View” came out a few weeks ago on 12-inch vinyl, cassette, and digitally via iTunes, Spotify, and other retailers. 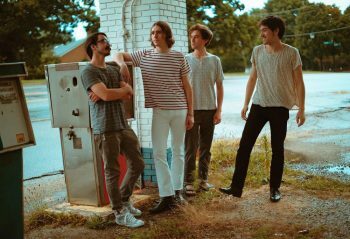 Echo Courts, which is based in Raleigh, North Carolina, plays jangly, guitar-driven power pop with plenty of vocal harmonies – sort of like Raleigh’s legendary pop-rock band from the 80s, the Connells. “I don’t know what genre we’re supposed to be in,” said Fahey. Usually, I just say rock-and-roll – two guitars, bass and drums. Video link for Echo Courts – https://youtu.be/EXHNS-OfTu8. The show at Johnny Brenda’s, which has Line Lender and Fred Beans as openers, will start at 9 p.m. Tickets are $10. Other upcoming shows at Johnny Brenda’s are Alice Bag on August 12 and Sparta on August 13. This has been a great nine day-stretch for area Heart fans with three concerts featuring musicians who have been key members of the hit-making band from the Pacific Northwest. On August 4, Ann Wilson, one of Heart’s two main vocalists, shared the bill with Jeff Beck and Paul Rodgers in Camden. On August 9, Heart By Heart, a group featuring original Heart members Steve Fossen and Michael Derosier, performed at the Sellersville Theater. Last but not least, Nancy Wilson, Ann’s sister who played guitar and shared the vocal duties in Heart, will headline a show at Parx Casino’s Xcite Center on August 12. 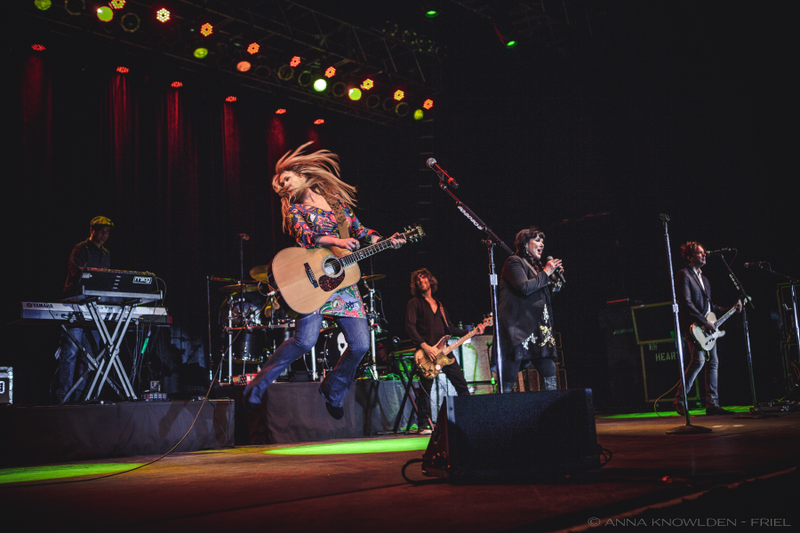 In late 2016 with Heart on an indefinite hiatus, Wilson formed a band called Roadcase Royale with former Prince band member and R&B singer Liv Warfield, lead guitarist Ryan Waters (the musical director for Warfield’s solo work and Prince protégé), and three Heart alumni — keyboardist Chris Joyner, bassist Dan Rothchild and drummer Ben Smith. Roadcase Royale released its first single, “Get Loud,” in January 2017. The band signed with Loud and Proud Records in July 2017 and released its debut full-length album “First Things First” on September 22, 2017. “A couple years ago when Heart was doing a couple nights at the Hollywood Bowl, I saw Liv Warfield with her band,” said Wilson, during a phone interview last week from her home in Los Angeles. “She just owned it – killed it – and I was floored. We offered them an opening slot for two nights at the Hollywood Bowl. Back then was when I talked to her about doing some music together. She wanted to do more rock and less R&B. Heart was always rock with some R&B. “A little while later, Ann was already doing her own thing. I was in New York, met up with Liv and we got together in a rehearsal space. Liv brought Ryan and we started working on music right away. “We did an arrangement of a song by Colin Hay – ‘Hold On To My Hand’ – and we nailed it the first time we played it. We had so much fun working with each other – no egos – everybody worked together well. The work ethic was big – and professional. We made the album pretty quickly. Her status as a rock icon was cemented when Heart was inducted into the Rock n’ Roll Hall of Fame in 2012. That same year, she and her sister received a star on the Hollywood Walk of Fame. “My live shows now are half-and-half – Heart music, the biggest hits, and a few original things,” said Wilson. “There are some Roadcase Royale songs and a couple Pink Floyd covers. Wilson also had an answer to the question asked by all Heart fans – will there be a reunion and tour any time soon? Video link for Nancy Wilson (with Roadcase Royale) — https://youtu.be/_tDK7mRihqk. The show at Parx Casino’s Xcite Center on August 12 will start at 7:30 p.m. Ticket prices range from $25-$55. Matranga celebrated the 20th anniversary of “Water & Solutions” this past March with a special live-streamed intimate performance. Now, he’s taking that celebration on the road with a carefully-selected backing band. Matranga’s backing band is also the band that will be the opening act on this tour – The Pauses. The two-pronged tour will touch down in the area on August 12 for a show at Boot and Saddle (1131 South Broad Street, Philadelphia, 215-639-4528, www.bootandsaddlephilly.com). Orlando indie-rock trio The Pauses — multi-instrumentalist Jason Kupfer, vocalist/bassist/keyboardist Tierney Tough, and drummer Nathan Chase – will be pulling double-duty nightly, opening each show with their own set and then serving as Matranga’s backing band. “We grew up as huge fans of ‘Waters & Solutions’,” said Tough, during a phone interview this week during a break in pre-tour rehearsals in Orlando. The Pauses’ roots go back about 15 years to a band that shared its name with a Russian satellite. Tough was referring to The Pauses’ sophomore album “Unbuilding,” which was produced by J. Robbins and released June 22, 2018. Kupfer explained the seven-year gap between albums by The Pauses. The Pauses showed some serious progress with their new album. Produced by the legendary J. Robbins, the album reflects his influence in the heavier guitar propulsion that churns under the allure of the electronic ear candy on the surface. Video link for The Pauses – https://youtu.be/P6dkOeMwxP0. The show at Boot & Saddle on August 12 will start at 8:30 p.m. Tickets are $15. Other upcoming shows at Boot and Saddle are E Joseph and the Sparrows on August 11 and Whiskey Shivers on August 15.